I’ve been using a Lenovo X201 Tablet in a docking station as my main machine for about 3 years now. 8GB RAM hasn’t been enough for a while, which is why I got 16GB for my X230 laptop, and I’ve been having issues with the CPU running out of steam when using Skype and Google Hangouts. 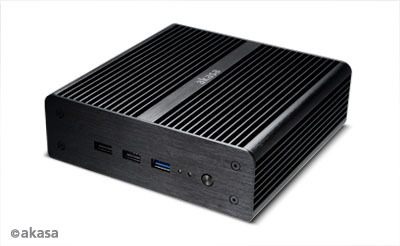 I first came across Intel’s Next Unit of Computing (NUC) at Intel’s Developer Forum (IDF) in San Francisco in 2012. At the time I was a little dismissive of it in comparison to the Raspberry Pi for applications like streaming media, where it’s just too expensive (and larger than it needs to be). I did however feel that it would be a good basis for a small, quiet and frugal desktop machine. Built in sound might have tipped me towards the newer i5-4250 model, but they’re not actually available, which is why I ended up getting an i5-3427 one (for £260 on eBay). The i5 version also had the gigabit ethernet and DisplayPort connectors that I wanted. The NUC comes bare bones, so I popped in 16GB of RAM and a 480GB mSATA drive (both from Crucial). I moved a Windows 8 license over from an old Microserver, and jumped straight to 8.1 on install. A USB2 hub and a cheap USB sound adaptor from eBay finished things off (sadly my Dell 27″ monitor doesn’t seem to do sound over Displayport). It’s subjectively very fast, though I might still be in the new machine honeymoon period. Sadly I can’t get Windows Experience Index numbers as WEI was ditched with the 8.1 release. Boot up speed is particularly good. Less subjectively it clocks a Geekbench of 4815, which beats my same generation i5-3320M powered laptop at 4065. It’s quiet, but not quite silent. I would still notice the fan on the laptop, and I still notice the fan on the NUC. It’s nowhere near annoying or even distracting, but it’s there. I may have to splash out on the Akasa Newton V fanless case, which would also bring a couple of extra USB2 ports up front. Update (13 Mar 2013): So I didn’t last very long. I ordered the silent case from CCL a few days after writing this, and I’ve been enjoying a silent working environment ever since. The NUC has received a bit of criticism for not having a mains cable for it’s power supply unit – it needs a C5 ‘cloverleaf’ (aka Mickey Mouse) lead. That wasn’t a problem, as it’s the sort of thing I do have lying around. The peril comes from a lack of battery backup. Having used laptops for the last few years I’ve survived the all too frequent cuts and brownouts in my area, so it’s a rude shock to be back on the unreliable mains grid (especially when plumbers decide to do safety tests that trip my residual current detector – apparently it’s ‘too sensitive’). I’m awaiting delivery of an IEC-C5 cable so I can run the NUC off my UPS. I’m very happy with the NUC. It looks pretty on my desk, and offers up good performance without using loads of power and without making loads of noise. I may yet splash out on the silent case to get quiet PC nirvana. Apart from that I should be happy until I need something that can drive a 4K monitor (once they’ve sorted out all of the issues with driving those screens). It’s a total mystery to me why a 35W CPU is beaten by a 17W CPU, but I’m left wishing that my laptop could use those watts better.